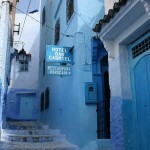 Chefchaouen in Morocco has many historical links with Ronda and is known as the Pearl of the North. Its only a short trip across the Straits of Gibraltar yet you will be transported into a world apart, and is well worth a visit if you are looking for something a little bit different and extra special. 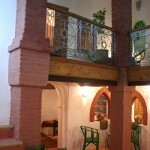 We were lucky enough to pay a visit to this beautiful town and stayed at the lovingly restored Riad hotel Dar Gabriel. An oasis of tranquility from which to discover this interesting area. 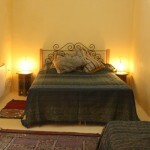 The hotel has seven beautifully decorated bedrooms all of which are ensuite, with the added luxury of a comfortable sitting room, heated in winter by a wood burning stove, an intimate dining room where you can also enjoy traditional home cooked meals by your hosts Ben Salam and Izza- amongst the delights on offer are tajines; a moroccan traditional dish cooked in a conical clay pot on hot coals, this method of cooking leaves all the flavours intact and the meat succulent. 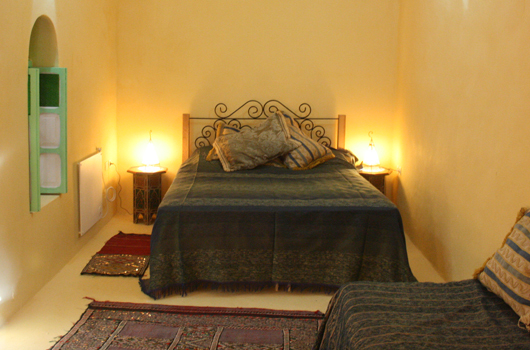 We particularly enjoyed the chicken, almonds and apricots accompanied by a fresh Moroccan style salad. 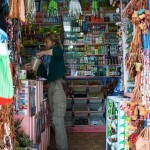 Izza explained that all the ingredients she uses are bought locally and are mainly homegrown. After our meal we just went up onto the spacious roof terrace to enjoy the views, sights and sounds of this magical city. 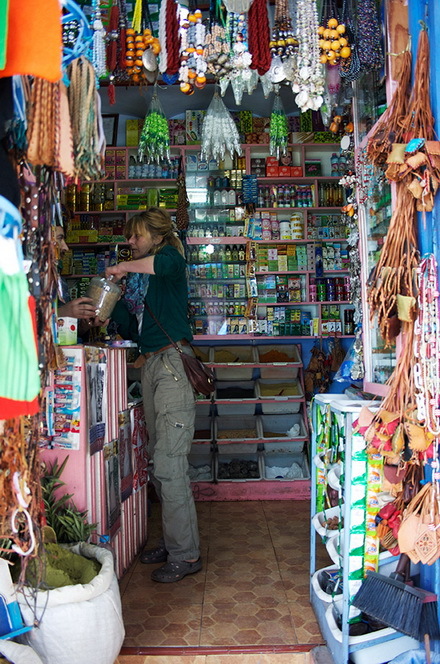 By day we explored the myriad of tiny streets, lined with all sorts of merchants selling local handicrafts for which the town is famous. 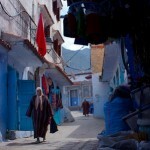 Relaxing in the main square with a glass of Moroccan mint tea was a favorite past time after a long days shopping. It wasnt long before we decided to venture a little further than the town itself. 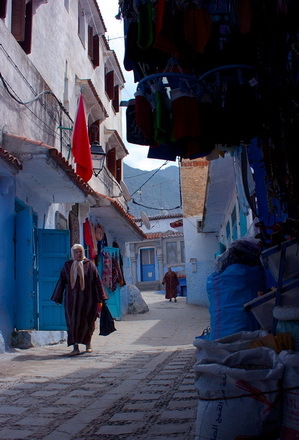 Chefchaouen is surrounded by beautiful, unspoilt countryside, so we decided to take advantage of one of the walking routes that the hotel has to offer. 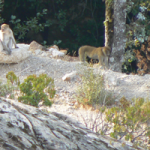 It was a bit of a difficult choice as there were four trails to choose from, but we opted for the Bouhachem Barbary Macaque Conservation trail, where we hoped to see the Barbary Macaque monkeys ( the same as can be seen on the Rock of Gibraltar) in their natural habitat. 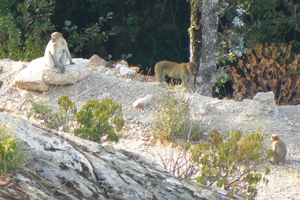 Guided by a local naturalist, we were treated to an interesting trek, highlighted by the monkey sightings, wild flowers, and bird watching. If you are at all interested in wildlife this is definately the trail for you. Our hosts Izza and Ben Salem, explained that there were also trails to cristal clear waterfalls, that were a must in the hot summer months, and a visit with an overnight stay to the natural park of Tallasemtane where the luggage is carried by a mule and one can also cool off in the refreshing rock pools at the end of a long days trekking. 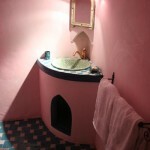 To book a visit at Dar Gabriel visit www.dargabriel.com or contact Kit or Penny Hogg direct on 0034 952 11 74 86 or mobile 0034 686 888 409 or email on penny@dargabriel.com. 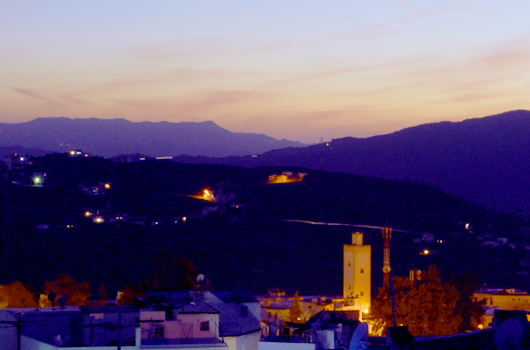 You may be wondering why a website about Ronda has an article about a hill top town in Morocco, but actually these two towns, despite being only recently twinned, share deep historical and demographic roots. 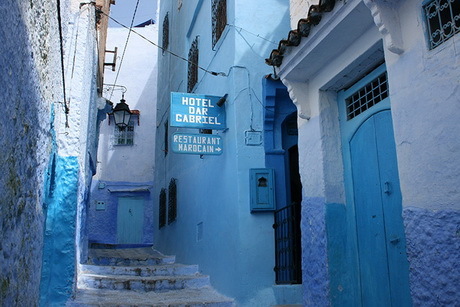 Chefchaouen was founded by Moulay Ali ben Rachid in 1471 as a stronghold from which the Berber tribes could defend themselves from attacks by the Portuguese invaders. 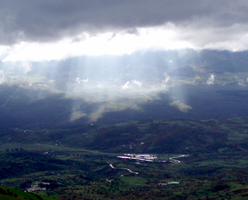 The new inhabitants were mainly Muslim refugees that came from Spain. 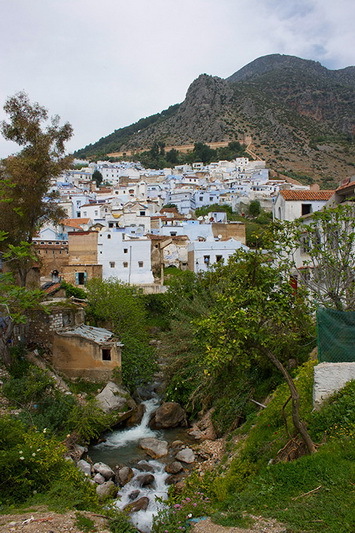 In 1485 when Ferdinand and Isabella conquered Ronda the entire city was exiled to the Genal villages, then in the great exile that took place some 70 years later these refugees were exiled to Morocco and many ended up in the hilltop town of Chefchaouen. 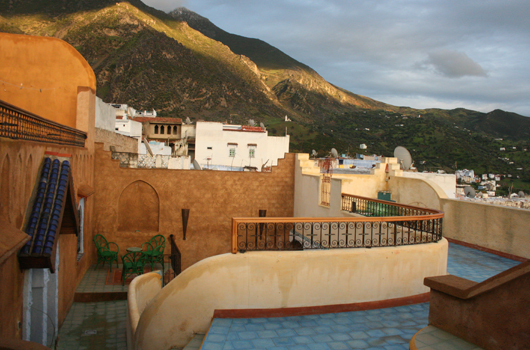 They set about building houses reminiscent of their erstwhile Spanish homes, which is why the town is distinctly Spanish in flavour, the whitewashed houses, with tiny balconies, tiled roofs and patios, are reminiscent of many a white Spanish pueblo. Up until the 1920s when the Spanish took over, the town was infact closed to all foreigners, especially to the Christians, that is until the beginning of the Spanish occupation in 1920. During the war of the Rif, Abs-el Krim was able to oust the Spaniards from 1924 to 1926, but the Spaniards fought back and retook the town in the September of 1926 remaining in power until Moroccan independence in 1956. 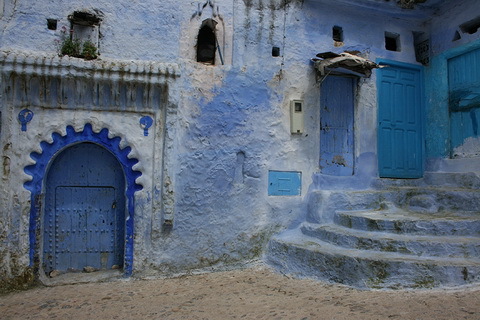 The blue color that is now synonymous with the town was actually only introduced in the 1930s by the Jews, up till then the windows and doors had been painted green, the traditional Muslim color. 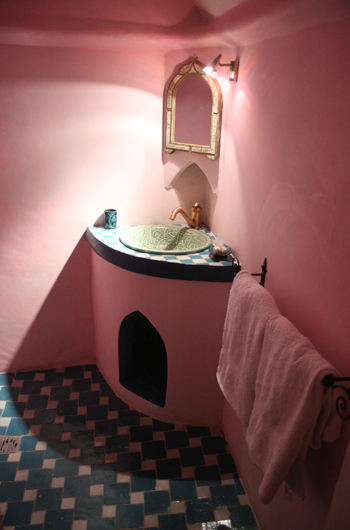 We were lucky enough to stay in a beautifully restored Riad house turned boutique hotel Dar Gabriel, located in the historical Medina from where we explored the charms of this relaxed and friendly town. 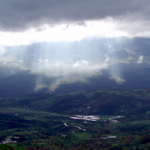 The first view of Chaouen, as locals call it, is stunning, sitting cradled between the mountain peaks above the fertile Oued Laou valley. 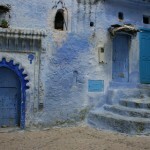 Upon entering the town itself one is transported into a fairy tale world of higgledy piggledy streets framed by the glowing blues and greens of the centuries old whitewashed houses. 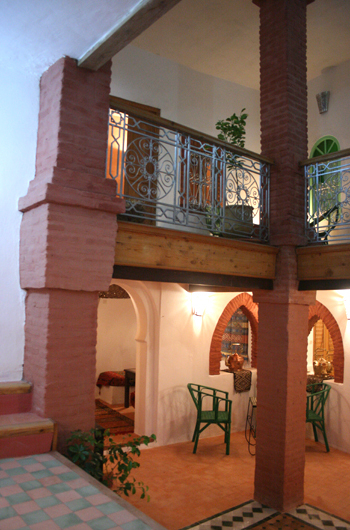 The Medina is the old part of the town and at its heart is the Plaza Uta El-Hammam. 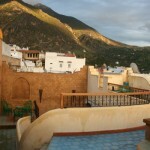 It is here where you can watch the world go by enjoy the sights of the Kasbah and the beauty of the Grande Mosque. 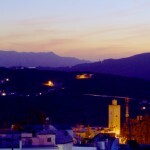 This mosque is unique in Morocco as it is the only mosque with an octagonal shaped minaret. The walled fortress of the Kasbah is also home to one of the most beautiful gardens in the town and nearby is a small Ethnographic museum. There is also an interesting art gallery that features paintings of the town throughout the ages. 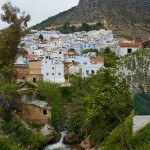 Chefchaouen is extremely easy to get to from Spain, there are ferries from the major port of Algeciras, or from Tarifa on the high speed ferry, or just a short flight from most major airports. So why not explore and discover this wonderful place that feels almost otherworldy yet is only a short trip across the Straits of Gibraltar.